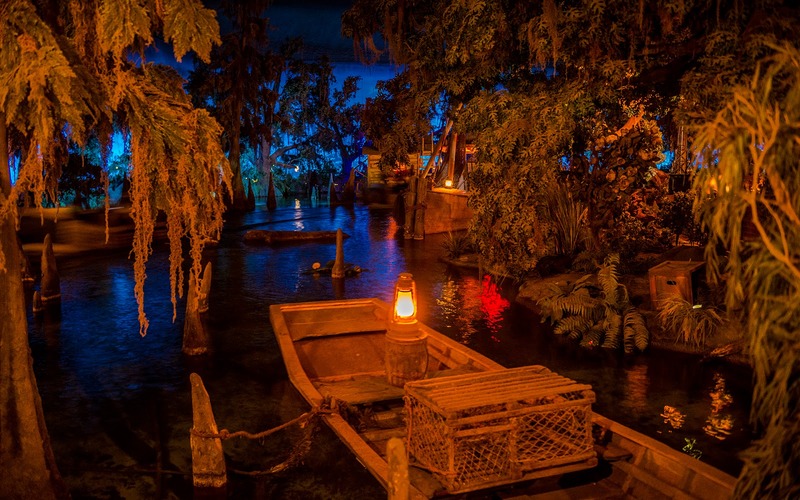 We stay in New Orleans Square today and head over to the Pirates of the Caribbean ride, where ambiance of the Louisiana bayou serves a serene contrast to the swashbuckling excitement that will be coming later in the ride. In this exposure, extended to capture more light than the human eye can typically perceive, we see a lone lantern sitting on a crawfishing rowboat. The cage is empty of the catch, but the atmosphere exudes that peaceful Southern charm. I used to love to take in the ambiance when I was a child, and even now as an adult, I enjoy the immersive environment this scene creates. The scene down in the bayou of Pirates of the Caribbean.